Another year has gone by and here are the 2018 search statistics for our handgun database. The total database view volume for 2018 was 842,802 views, which is up from 2017 by over 110,000 views. Note, this number is for all views (Make, Model, Caliber, Variant) and includes repeat views from the same visitor. What we want to see though, is which manufacturer and model (regardless of caliber and variant) received unique (non repeating) views for the year. With those filters set the number of distinct views for the year was 564,339. That's unique views from over a half a million visitors in 2018. Here's the breakdown including gun type. It should be noted that the number one gun searched for and viewed in 2018 is the Colt .380 Government. This particular gun made the top of our list for 2017 as well. But, Colt wasn't the number one manufacturer searched for and viewed in 2018. 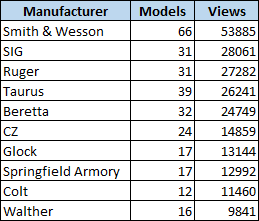 That title goes to Smith & Wesson with a total of 53,885 views across 66 different models. Remember, you can always view the top twenty handguns searched for the current month HERE. Finally, here are the top 500 handguns searched for and viewed in 2018. Is your gun there?